Paper size: 22" x 25 11/16"
Canvas size: 30" x 35"
(outside of the Continental U.S.) are subject to additional shipping charges. "When we get to Chunking, I'm going to give you all a party that you won't forget," was Lt. Colonel James Doolittle's promise to the 16 B-25 crews aboard the USS Hornet a few days before their historic air raid on Japan. By late afternoon on April 18th, 1942 the relative safety of the China coast was all that Lt. Donald G. Smith's crew had on their minds. The 15th aircraft (# 40-2267) to leave the carrier's deck had bombed its targets in Kobe, Japan but the crewmen knew they'd never make their designated landing strip on the Chinese mainland. The weather had become increasingly worse and visibility had dropped to zero. Lt. Smith was forced to ditch his bomber off an island on the Chinese Coast near Sangchow. All of Aircraft 15's crew would eventually make their way to Chunking but sixteen of the other Doolittle's Raiders did not. Doolittle himself would rise to the rank of full General. It is the stuff of aviator legend that when the last Raider makes his final flight westward into the day's fading light he will be greeted by his fellow Raiders and the General, and they will have a party never to be forgotten. 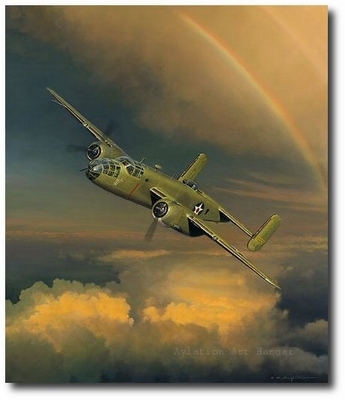 When Bill Phillips painted The Giant Begins to Stir, he embarked on an artist's journey that grew to become a visual history of the United States' response to the Japanese bombing of Pearl Harbor: Lieutenant Colonel Jimmy Doolittle's air raid on Japan launched, for the first time ever, from the sea. The limited edition of The Giant Begins to Stir (co-signed by surviving Doolittle Raiders) was followed by I Could Never Be So Lucky Again (co-signed by Jimmy Doolittle) and Evasive Action at Sagami Bay, (co-signed by surviving Doolittle Raiders.) The final painting in this series is Westbound: A Date with the General, illustrates the dramatic flight of Lt. Smith's Crew #15. "Why chronicle any historical event?" asks artist Bill Phillips. Because paintings like Westbound: A Date with the General, he says, "help us to understand the times in which we live. Remembering the sacrifices of brave men and women help us to be more aware of how we should view this great country and the freedoms we so often take for granted." In an interesting aside, Bill Phillips' father, a character actor in Los Angeles in the 1940s and '50s, played a pilot in the film 30 Seconds Over Tokyo, as well as in Dive Bomber, and as Sergeant Kirby in A Yank in Korea. "Approaching the Gate to Destiny"